Karen Head has finished her series on how well the freshman-composition course fared (quoted and linked below), published in The Chronicle. The stats were disappointing — only about 238 of the approximately 15K students who did the first homework finished the course. That’s even less than the ~10% we saw completing other MOOCs. Georgia Tech also received funding from the Gates Foundation to trial a MOOC approach to a first year of college physics course. I met with Mike Schatz last Friday to talk about his course. The results were pretty similar: 20K students signed up, 3K students completed the first assignment, and only 170 finished. Mike had an advantage that Karen didn’t — there are standardized tests for measuring the physics knowledge he was testing, and he used those tests pre-post. Mike said the completers fell into three categories: those who came in with a lot of physics knowledge and who ended with relatively little gain, those who came in with very little knowledge and made almost no progress, and a group of students who really did learn alot. They don’t know why nor the relative percentages yet. It’s not surprising, but it is relevant. Students need to make effort to learn. New college students, especially first generation college students (i.e., whose parents have never gone to college), may not know how much effort is needed. Who will be most effective at communicating that message about effort and motivating that effort — a video of a professor, or an in-person professor who might even learn your name? No, the course was not a success. Of course, the data are problematic: Many people have observed that MOOCs often have terrible retention rates, but is retention an accurate measure of success? We had 21,934 students enrolled, 14,771 of whom were active in the course. Our 26 lecture videos were viewed 95,631 times. Students submitted work for evaluation 2,942 times and completed 19,571 peer assessments (the means by which their writing was evaluated). However, only 238 students received a completion certificate—meaning that they completed all assignments and received satisfactory scores. Our team is now investigating why so few students completed the course, but we have some hypotheses. For one thing, students who did not complete all three major assignments could not pass the course. Many struggled with technology, especially in the final assignment, in which they were asked to create a video presentation based on a personal philosophy or belief. Some students, for privacy and cultural reasons, chose not to complete that assignment, even when we changed the guidelines to require only an audio presentation with visual elements. There were other students who joined the course after the second week; we cautioned them that they would not be able to pass it because there was no mechanism for doing peer review after an assignment’s due date had passed. via Lessons Learned From a Freshman-Composition MOOC – Wired Campus – The Chronicle of Higher Education. These results seem consistent with Mike Hewner’s thesis results. If a student likes her intro course more, they are more likely to take that major. Students use how much they enjoy the course as a proxy for their affinity for the subject. Those are the findings of a paper presented here during a session at the annual meeting of the American Sociological Association by Christopher G. Takacs, a graduate student in sociology at the University of Chicago, and Daniel F. Chambliss, a professor of sociology at Hamilton College. The paper is one part of How College Works, their forthcoming book from Harvard University Press. via Study finds choice of major most influenced by quality of intro professor | Inside Higher Ed. I couldn’t believe this when Mark Miller sent the below to me. “Maybe it’s true in aggregate, but I’m sure it’s not true at Georgia Tech.” I checked. And yes, it has *declined*. In 2003 (summing Fall/Winter/Spring), the College of Computing had 367 graduates. In 2012, we had 217. Enrollments are up, but completions are down. What does this mean for the argument that we have a labor shortage in computer science, so we need to introduce computing earlier (in K-12) to get more people into computing? We have more people in computing (enrolled) today, and we’re producing fewer graduates. Maybe our real problem is the productivity at the college level? I shared these data with Rick Adrion, and he pointed out that degree output necessarily lags enrollment by 4-6 years. Yes, 2012 is at a high for enrollment, but the students who graduated in 2012 came into school in 2008 or 2007, when we were still “flatlined.” We’ll have to watch to see if output rises over the next few years. Computer-related degree output at U.S. universities and colleges flatlined from 2006 to 2009 and have steadily increased in the years since. But the fact remains: Total degree production (associate’s and above) was lower by almost 14,000 degrees in 2012 than in 2003. The biggest overall decreases came in three programs — computer science, computer and information sciences, general, and computer and information sciences and support services, other. This might reflect the surge in certifications and employer training programs, or the fact that some programmers can get jobs (or work independently) without a degree or formal training because their skills are in-demand. Of the 15 metros with the most computer and IT degrees in 2012, 10 saw decreases from their 2003 totals. That includes New York City (a 52% drop), San Francisco (55%), Atlanta (33%), Miami (32%), and Los Angeles (31%). via In the Spotlight: Higher Ed Degree Output by Field and Metro | Newgeography.com. This is our problem in computing, too. If students have never seen a computer science course before coming to college, they won’t know what hits them when they walk in the door. Experts estimate that less than 40 percent of students who enter college as STEM majors actually wind up earning a degree in science, technology, engineering or math. Those who don’t make it to the finish line typically change course early on. Just ask Mallory Hytes Hagan, better known as Miss America 2013. Hagan enrolled at Auburn University as a biomedical science major, but transferred to the Fashion Institute of Technology a year later to pursue a career in cosmetics and fragrance marketing. via Colleges Fight to Retain Interest of STEM Majors – US News and World Report. Google has found that being great at puzzles doesn’t lead to being a good employee. They also found that GPA’s aren’t good predictors either. Nathan Ensmenger could have told them that. His history The Computer Boys Take Over shows how the relationship between academic mathematics and brainteasers with computer science hiring was mostly an accident. Human resources people were desperate to find more programmers. They used brainteasers and mathematics to filter candidates because that’s what the people who started in computing were good at. Several studies found that those brainteasers and math problems were good predictors of success in academic CS classes — but they didn’t predict success at being a programmer! How many people have been flunked out of computer science because they couldn’t pass Calculus — and yet knowing calculus doesn’t help with being a programmer at all?!? via Google Finally Admits That Its Infamous Brainteasers Were Completely Useless for Hiring – Adam Pasick – The Atlantic. The growth of departments in the Taulbee report is astonishing, but what Computerworld got wrong is calling it “computer science enrollments,” as opposed to “computer science enrollments in PhD-granting institutions.” The Taulbee report doesn’t cover all CS departments, and that’s why the new NDC survey has been launched. The Taulbee report also indicates that the percent of women graduating with a Bachelors in CS has risen slightly, while the Computer Engineering percentage has dropped. Both are well south of 15%, though — a depressingly small percentage. The number of new undergraduate computing majors in U.S. computer science departments increased more than 29% last year, a pace called “astonishing” by the Computing Research Association. The increase was the fifth straight annual computer science enrollment gain, according to the CRA’s annual surveyof computer science departments at Ph.D.-granting institutions. via Computer science enrollments soared last year, rising 30% – Computerworld. In the context of David Notkin’s receipt of the 2013 Computing Research Association A. Nico Habermann Award for outstanding contributions to supporting underrepresented groups in the computing research community, Lecia Barker of the National Center for Women & Information Technology (we hosted their Washington State Awards for Aspirations in Computing last weekend) sent us the chart to the right, comparing UW CSE’s performance to the national average in granting bachelors degrees to women. via UW CSE News » Women in Computer Science: UW CSE is a pacesetter. It was really great to see these results in the U. Washington CSE News, but it got me to wondering: Did all the big R1 institutions rise like this, or was this unusual at UW? I decided to generate the GT data, too. I went to the GT Self-Service Institutional Research page and downloaded the degrees granted by college and gender in each of 2005, 2006, and on up to 2011. (All separate spreadsheets.) I added up Fall, Spring, and Summer graduates for each year, and computed the female percentage. Here’s all three data sets graphed. While GT hasn’t risen as dramatically as UW in the last two years (so UW really has done something remarkable! 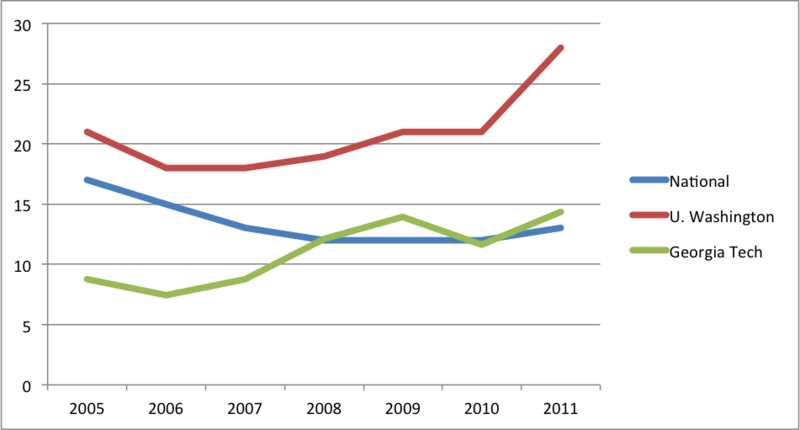 ), but GT’s rise from 2005 far below the national average to above the national average in 2009 is quite interesting. Why is UW having such great results? Ed Lazowska claimed at SIGCSE 2013 that it’s because they have only a single course sequence (“one course does fit all,” he insisted) and because they have a large number of female TAs. I don’t believe that. I predict that more courses would attract more students (see the “alternative paths” recommendation from Margolis and Fisher), and that female TA’s support retention, not recruitment. I suspect that UW’s better results have more to do with the fact that GT’s students declare their major on their application form, while UW students have to apply to enter the CSE program. Thus, (a) UW has the chance to attract students on-campus and (b) they have more applications than slots, so they can tune their acceptances to get the demographics that they value. Percentage of females in BS CS graduates, by year, nationally, for U. Washington, and for Georgia Tech.